For those who frequently visit my blog, you would already know that I am into gardening. I don't have the luxury of space in my yard but I managed to build plant boxes to accommodate some of my collection and I have gone to container gardening, as well. Just recently, I have developed a special interest growing succulents. I had my first batch delivered last month but I haven't figured out yet how to take good care of them. Succulents are low maintenance plants but it requires a full knowledge dealing with them if you want to be successful at growing them, like the amount of sunlight they need, amount of water, type of container and soil that you are going to use. Too bad, I am just too busy right now to do really look into all this, but I am planning to learn more about succulents. I also wanted to know what are the different varieties and how could I propagate them. One thing that I like most about succulents is that these are very decorative and do not occupy a lot of space. I could also play with the design and make them more appealing. I am planning to get few more varieties. 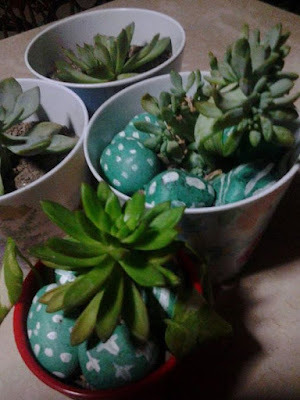 I hope I could also propagate what I currently have now since these succulents are a bit pricey. Will post more of this in my future posts.